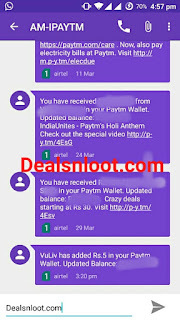 Hello Dealsnloot Readers,VuLiv Infinity Player Loot – Get Free Rs 5 Daily. We Have Found Another Best Paytm Cash Giving App Which Through You Can Get Free Rs 5 In Paytm /Udio/Oxigen Wallet. It’s an Awesome App to Earn Free Cash Daily. So Just follow some steps and Grab it fast.VuLiv Infinity Player is your FREE media player to organise & serve all your local, downloaded & on-line multimedia from a single platform within 1 Application. So Grab This Loot App and Get Unlimited Paytm,udio,oxigen wallet Cash Loot Trick. Update :- VULIV Player App Work Perfect.In This App You Get rs. 5 Per Refer and Daily Redeem Max. 500 Karma = Rs.5 Paytm/Udio/Oxigen/Mobikwik.I Am Personally Redeem Paytm Daily. 4) Now Sign up with Facebook or Google+. 5) Select “LIVE” option from the top left menu and then click on “WALLETS“. 6) You will now get options like Udio, Oxigen, Paytm, etc. So click on GET which is in front of Paytm. 7) Enter the details like name, date of birth and number. 8) Now do the verification process and verify your mobile number. 3. STREAM latest, trending videos from YouTube, Dailymotion ,News Republic ,India Today,India TV etc. 4. LIVE Mobile TV – for all Breaking News , Bollywood entertainment or Devotional TV Channel. 3 Reasons – Why you should Vu your media with VuLiv ? 1. NO Multiple Apps Download , NO Multiple Sign-in(s) or Switching in & out of different Apps such as Gallery,Video Apps , Live TV Apps JUST Simply SLIDE to your favorite section in My Media – Discover – Stream – All @ 1 place. 2. Gesture controls , My Media Recommendations, Kids Lock, Auto Play, Undo – Your “Delete By Mistake” moments. 3. Mix your videos with MixVu feature to watch your videos in cool video cocktail mode. This app is not opening in my phone. Earlier it was opening but when i upgraded my phone to marshmellow, it stopped running. Any idea what to do?